Includes CRMX (CPU) with 3 GE switched LAN ports and 1000Base-T WAN, Dual AC power supply , fans, OSN3 (2G RAM) and HDD pre-installed with Microsoft' SBA application. 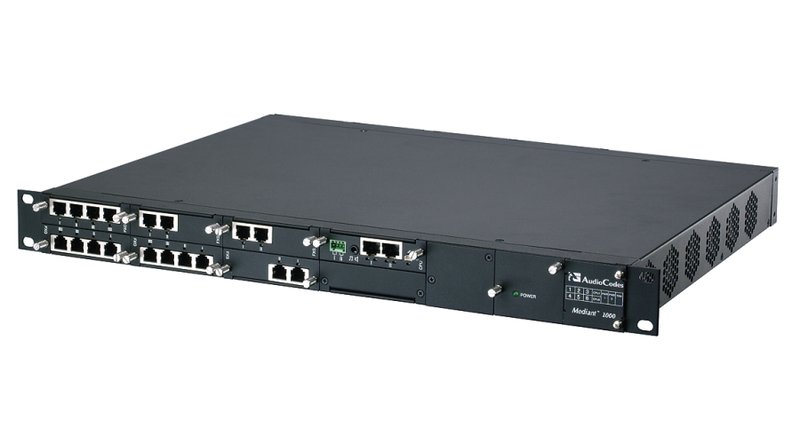 Chassis can be expanded with any Mediant 1000 PSTN modules such as FXS/FXO/BRI or T1/E1. Product does not include RS-232 cable (part #M1K-RS232) which is used to access the CLI for serial communication. The Mediant 1000 MSBG is an all-in-one multi-service access solution for Service Providers offering managed services and distributed Enterprises. This multi-service business gateway is designed to provide converged Voice & Data services for business customers at wire speed, while maintaining SLA parameters for superior voice quality. The Mediant 1000 MSBG is based on AudioCodes' VoIPerfect best-of-breed Media Gateway technology, combined with Enterprise class Session Border Controller, Data & Voice security elements, Data Routing, LAN Switching and WAN Access. These services allow smooth connectivity to cloud services.